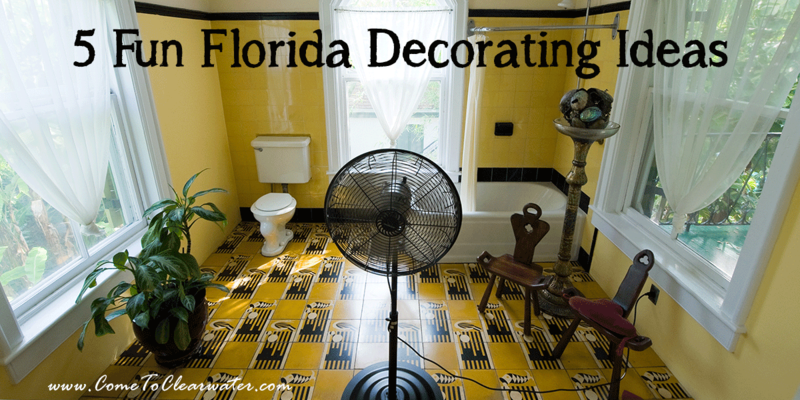 Whether you live in Florida or not, enjoying that Florida feeling in your home every day is possible. Decorating to bring in the sun, surf and beach can make you feel relaxed without having to travel to get it. Here are some ideas for you. Other touches could include glass holders with sand, shells and candles and photo frames decorated with shells, starfish etc. The option are endless. Not sure what to get? Visit a beachfront shop on your next vacation for ideas or opportunity to get some things. A sunny, bright color palette for your home will make it feel like a home at the beach. Use of aqua accents in items like pillows, throw blankets and rugs will bring the feeling of the sea inside. Then add pops of bright yellow or orange to remind you of bright sunny days. Or paint a room in shades of these colors. Want to take an ever bigger chance? Then think of the bright colors of South Beach or Key West: turquoise, fuschia, orange… again, either add them in pops of color to your existing color scheme or paint those colors. Adding whitewashed shiplap for a Gulf coast feel, adding a beach themed sunroom can make your home feel open, airy and like a vacation. Add louvered doors to doorways and painting them in aqua or one of the other beach themed colors adds that kind of flair as well. There are tons of ideas online and you can be as sparing or over the top as you want. Remember, it’s your beach home, so decorate to make your home yours.